Tradition and culture move in hand with the surging advancements of this city. The festivals are celebrated here with a lot of enthusiasm, spirit and with Hyderabad’s own ethnicity. The society celebrates most of all the festivals celebrated in India, but there a few festivals peculiar to Hyderabad alone. Lets us read on to be akin with the colorful festivals of Hyderabad city. 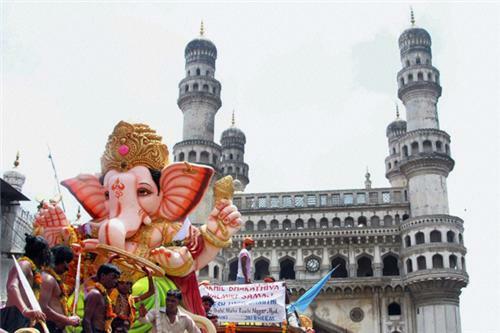 Ganesh Chaturthi is celebrated with a lot of liveliness in Hyderabad. Vinayaka Chaturthi starts on the fourth day of month Bhaadrapada of Hindu Calender and the festival is observed till the fourteenth day of the month. Beautiful pandals can be seen at every nook and corner, with different sizes of idols of Ganesh. Markets are filled with colorful torans, flowers and decoratives. Around 5000 Ganesha idols are immersed in the Hussainnagar lake and laddoos are offered in pandals as prasadam. Ugadi or ‘yug’ and ‘adi’ is the beginning of an year. It is celebrated in Chaitra month of Hindu calendar. The festival is welcomed with decorating the house with rangoli, mango leaves and prayers for prosperity. 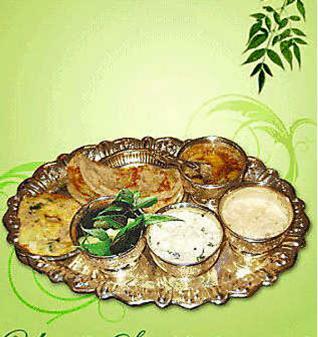 Ugadi pachadi and Obattu are the special dishes prepared and served by the locals on this special day. Bathukamma Panduga is a great festival of Telangana, celebrated to worship Goddess Gauri in glory of womanhood. Starting on Aswayuja Padyami, the festival closes on Maha Navami with Bathukamma panduga ceremony. Women prepare beautiful seven layer flower stack called Bathukamma, gather in their locality to sing and dance. After the rituals, Bathukamma is immersed in the river or any nearest water body. 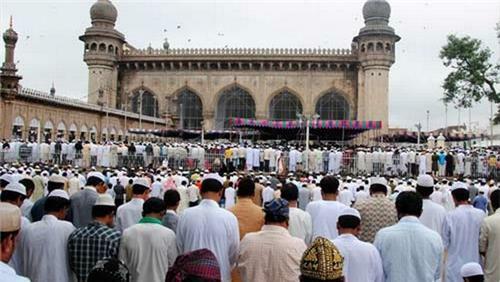 Hyderabad has a population of about 30 lakh Muslims, congregating them in Mecca Masjid of Hyderabad to offer prayers on Ramzan. Ramzan also called Id-ul-Fitr, is celebrated on the first day of tenth lunar month of Muslim calender. This festival is a much awaited event of Islam followers. All the lanes and roads to Mecca Masjid-Charminar Complex remain closed for traffic on Ramzan. Abids, SP Road, Sultan Bazars and a lot of other markets remain crowded for shopping. The markets dazzle with lights, decorations and bright banners to woo customers. Bakrid is celebrated in a grand way in Hyderabad. The eve of Bakrid is a day of major activities in the city. People take visits to Pathergatti, Charminar, Shahalibanda and Miralam Mandi for new clothes and groceries. The prices of sacrificial animals sour high, yet Chanchalguda, City College, Khilwat, Falaknuma, Darulshifa, Tolichowki, Bahadurpura remain the beeline sale points. People also visit mosques, mostly gathering at Mecca Masjid, Meeralam and Madannapet Iddgahs for prayers. 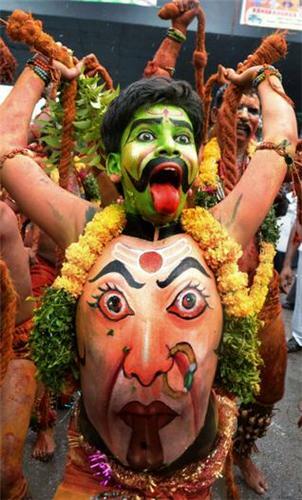 Big gatherings come together in Hyderabad to celebrate Bonalu festival. Bonalu is celebrated to please Goddess Mahakali by offering cooked rice and jaggery etc. This festival is celebrated throughout Andhra Pradesh, but is celebrated in the grandest way in Hyderabad and Secunderabad. The festival is celebrated in the month of Ashada and grand celebration starts at Mahakali Temple. In Hyderabad, Laad Bazaar near Charminar and Balkampet Yellamma Temple, Bonalu celebrations are grand. Amongst the festivities, Pothuraju dancers add to the magic by showing acrobats and other skills. Deccan festival starts on 25th February extending up to 5 days for festivities, organized by Andhra Pradesh Government. This festival intends to showcase music, literary works and cuisines of the city. Ghazal nights, Qawalis and Mushairas are performed. Kuchipudi and Kathak dance performances from world class dancers can be seen here. Hyderabad’s food and flavours are put to sample. Pearl and bangle fairs of this festival are special attractions of the festival. Lumbini festival is organised by Andhra Pradesh Tourism Department in Hyderabad to highlight remaining traces of Buddhism in Hyderabad. This festival is observed with utmost dedication by Buddha followers. The festival is celebrated for 3 days from second Friday of December annually. The festival is organised at Nagarjuna Sagar, where devotees from all across the world to honour the heritage of this religion in Hyderabad. Holi, Diwali, Dussehra, Rakshabandhan, Shivaratri, Shab-e-Qadr, Shab-e-Barat, Shab-e-Meraj, Christmas, Good Friday and Easter etc are other popular festivals celebrated in the city with a lot of enthusiasm like rest of India. i never heard about the festivals like ugadi, bathukamma panduga, bonalu, deccan festival, lumbini festival. thanks for giving the information!! i want to know that when the deccan festival is celebrated?